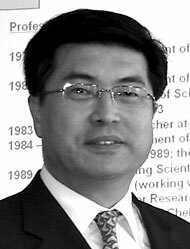 Kookheon Char teaches and conducts research on the fundamental and applied aspects of thin films involving macromolecules and nano-objects at the College of Engineering at Seoul National University (SNU) in South Korea. He has been a fellow of the American Physical Society since 2010. He is in close contact with JGU as one of the leading scientists at the International Research Training Group "Self-organized Materials for Optoelectronics" of JGU and SNU. In 2006, he received the Gutenberg Research Award from the Graduate School of Excellence MAINZ. Press release "Johannes Gutenberg University Mainz intensifies cooperation with Seoul National University and Peking University"